This is 'Samus', formerly (before Mt. Rogers) know as 'Silent Sam', whom I met today (Friday, April 27th) at the Bake Oven Knob shelter. Samus was number 7 to register this year at Harpers Ferry, and he says he's passed two of those since. But he's the first thru-hiker I've been able to identify as such since flipping north to PA. Yay! 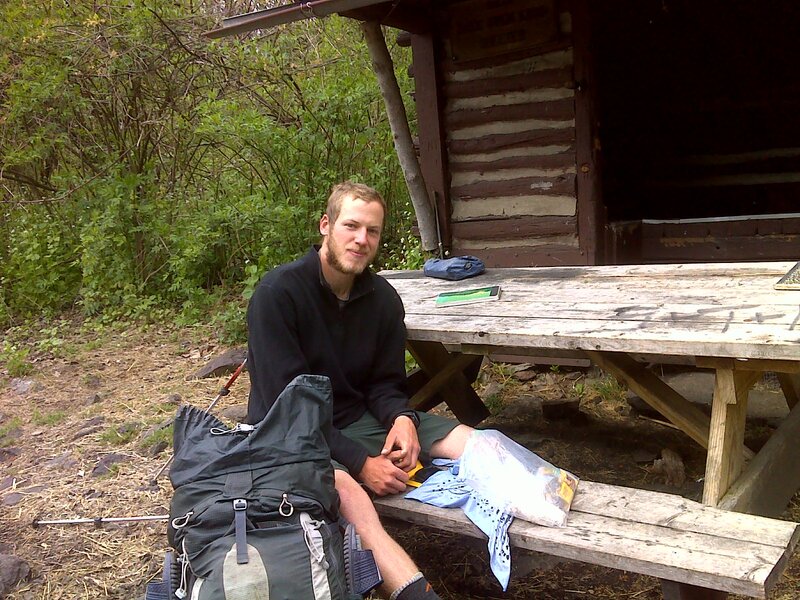 He left Springer Feb 28th and hopes to hit Katahdin in mid-June. Good luck, 'Samus'! For the full report from today, time restrictions force me to once again copy and paste from my personal journal, with hopes I'll be able to insert photos. In any case all 31 selected photos taken today appear on my Every Trail link. 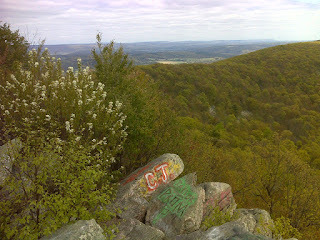 Lehigh Gap parking area. There I got ready for hiking; and I was on the trail at about 7AM but the parking lot was not making me feel comfortable. There was only one car there and it was the same one I had seen when I scouted the lot after midnight (despite the sign saying the area is closed overnight). And there was a creepy looking guy sitting in the car, hood of a sweatshirt over his head, just sitting – didn’t do much of anything. As I started hiking, I quickly came into view of the highway and bridge over the Lehigh River below and saw a gravel space at the intersection on the east end of the bridge. So I aborted my hike, returned to my vehicle and moved it there. But then I got uncomfortable with that lot because there were two mailboxes beside the road and a walkway up from an adjacent house, and the only vehicles parked there seemed to be associated with the house. Still I did a short out and back both ways from there, first back up to the lot where the creepy guy was still sitting in his car, then the other way across the bridge where I found a small gravel parking area that looked perfect, right where the AT starts the climb up the south face of the gap and adjacent but distinctly separate from a private driveway. So I returned to my steel tent and moved it there. Finally it was after 8AM when I started up the hill southbound. I climbed to Outerbridge Shelter, a very rustic old one, built in the 1930’s, the front of which is literally on the trail. I signed the register and moved on up the mountain, making various stops for clothing adjustments as it was a windy day with cold air moving in. 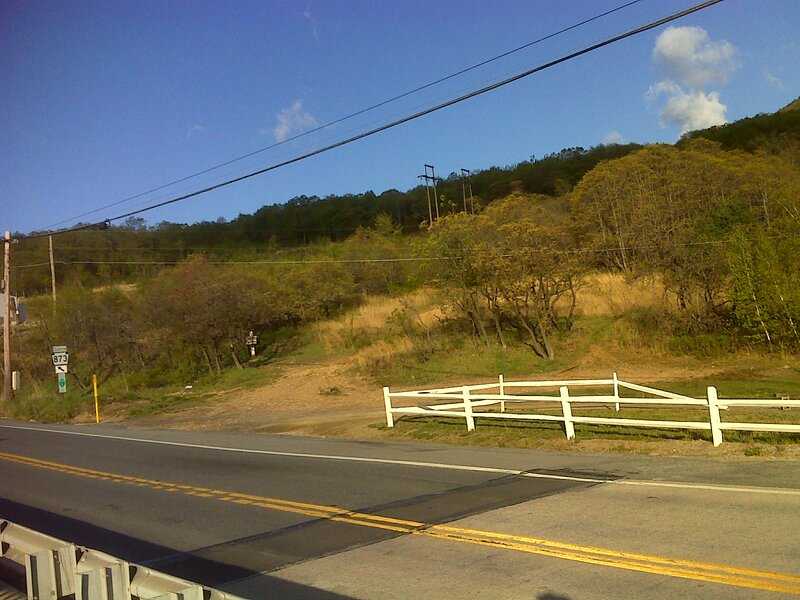 On the warm sunny wind-shadow side of the mountain I was warm, but needed all my layers and my hood once I got to the exposed top where the vegetation is recovering from the effects of the Palmerton zinc smelting operations. The smelters continued to operate even as all the vegetation on the surrounding slopes and ridges completely died off down to bare rock and soil. 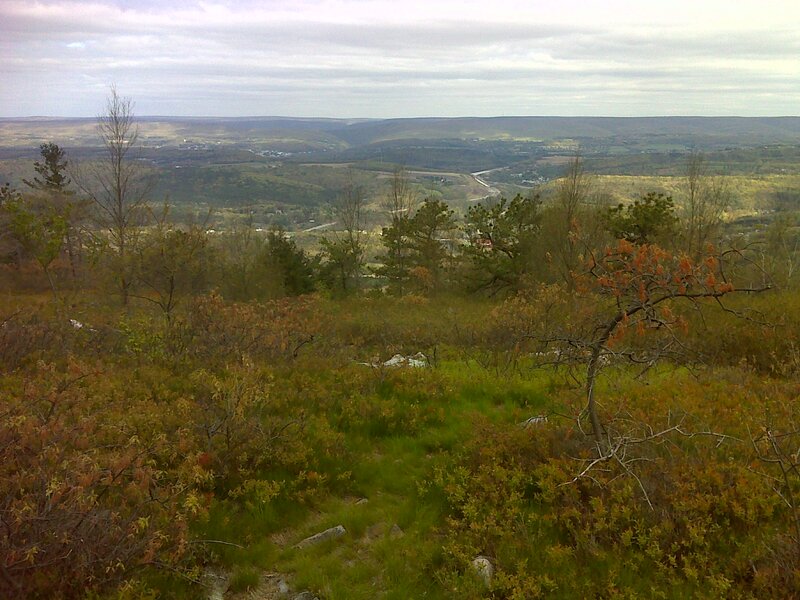 Now the recovering ridge I crossed today is remarkably pretty with clumps of trees returning but still many open vistas where only low shrubs including tons of blueberry bushes and mountain laurel are thriving. I took my time through this couple miles of very different, very pretty ridge top both to enjoy the views and because the trail was fairly rocky. Eventually I was back in the woods and walked a more than one mile long arrow-straight section from a county line monument, along the boundary to near Ashfield Road. There I met Laurie, Husband and Elf for the third day in a row. They were taking a rest under a tree beside the Road. We had a nice chat again and I took a photo and Laurie, who seems a shutter bug, took lots of them. Beyond Ashfield Road the serious big rock hit me for the first time – a fairly short intense section through a power line clearing. Then it let up partially for a while. In this section I found a rock right on the trail with the characteristic quartz striations running like lines through dark rock – today’s hike seemed the epicenter of this distinctive rock type, and the particular specimen I found had a very good natural AT logo in it. Best of all the rock was of manageable size – less than ten pounds. I stowed it and marked the waypoint, so I could pick it up and carry it back on the way ‘home’ – about 4.5 miles of carrying that rock. 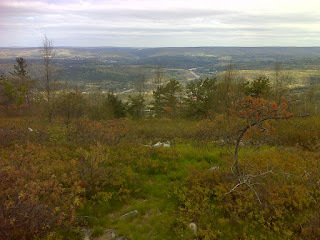 On I went through more semi-rocky trail, then a long very rocky stretch, 0.4 miles, through outcrops with no views. Another break from rock was fairly short and included the section where Bake Oven Knob shelter is located. I stopped in and took a photo and signed the register as usual. As I was sitting at the picnic table with the register a hiker came in and sat down and dug a snack out of his pack. “You’re Seeks It?” he asked as he saw me sign the register. He’d seen my entries farther south. 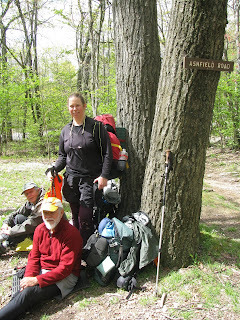 We got to chatting and I learned that he is a thru-hiker – the first I’ve encountered since starting my leg north. ‘Samus’ formerly ‘Silent Sam’ (he changed trail names in the Grayson Highlands area) started in Springer on February 28th. That means I should have encountered him somewhere along the trail down south, but apparently we missed each other. He said he was the seventh to register at Harpers Ferry, and now the fifth on the trail, as he had passed two of them. 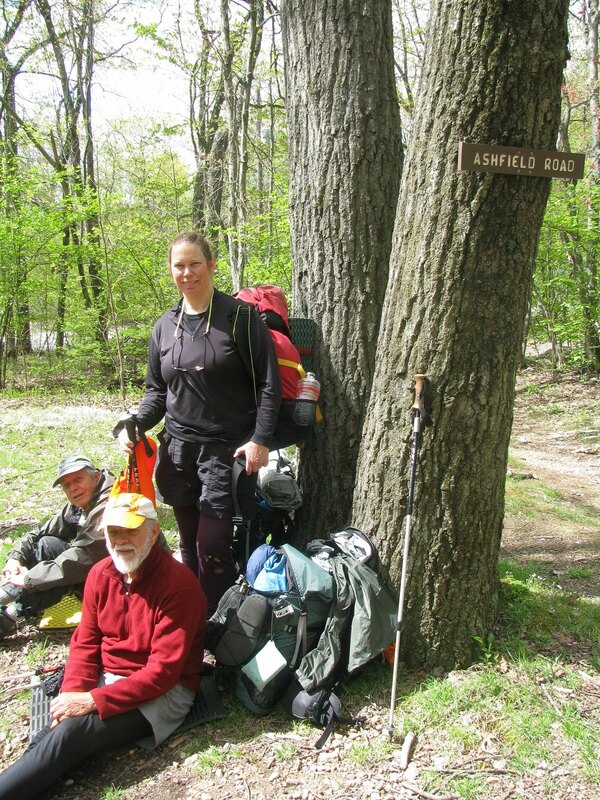 I had been noting register entries from two thru-hikers – T-Bone and Tolstoy. He knew of Tolstoy, but T-Bone (came thru here March 15th) was too far ahead. I got Samus’ photo and wished him well. From there I made the tough approach to Bake Oven Knob from the north over plenty of big gnarly rock. The summit was populated by five partying guys, very high and talkative, and a separate contingent of two quiet girls, all of whom who were up there from the parking lot. I chatted with the one most vocal of the guys while taking photos of the excellent views from the top, then headed down the extremely heavily used half mile of quite easy trail to the big parking lot that was my turn-around point. That side has only a little rock scrambling just before the summit. I had taken my time all day not only to negotiate the rocks and soak in the experience but to be sure my neck and shoulder problems remained in check. And I was successful in that. I turned around at 2PM after six hours on the trail (seven if you count the aborted start and the back-and-forth hike from the second parking place). But it took me only until 6:15PM to get back to my third and final parking place. It continued to be a windy, chilly day but the midday overcast was giving way to more sun as I descended back to Outerbridge Shelter. There I found about 5 people, some just arriving. And one asked if I was ‘Seeks It’. He was very coy about explaining how he knew my name, finally revealing that my brother was waiting for me at the parking lot. But when I got there Jim had left, so I hurriedly did the minimum wrap-up work for the hike, didn’t change clothes, and headed down to my nephew’s house, barely two miles away. Here's my walk plotted on a map and a link to the 31 photos, as promised.